Fukuoka Growth 006 introduced the case of global networks’ use of Fukuoka City. This edition 007 introduces examples of IRBC cities utilizing their global networks. Furthermore, based on the previous contents, this edition reviews the globalization of Fukuoka City and its global position in fostering innovation and examines the challenges necessary for Fukuoka city to become an innovation hub city. In 2015, in Bellevue City, Seattle (Washington State, USA), University of Washington and Tsinghua University, so-called “China’s MIT,” received funding of $ 40 million by Microsoft and jointly established “Global Innovation Exchange (GIX),” graduate school (advanced innovation research institute) specialized in technology and innovation. GIX aims to cultivate talents capable of becoming an innovation leader by collaborating across universities and investors with state-of-the-art innovation. In the fall of 2016, 10 people first started the program at Tsinghua University in Beijing (*1). Half of the 43 students enrolled in the Master’s Program in Technology Innovation, which was held at the new campus of UW in Bellevue City in September 2017, accounted for US and Chinese born students, the remaining half being from Canada, Estonia, France, India, Pakistan, Paraguay, Russia, Switzerland and elsewhere. (*2). As the goal is to accept 3,000 students, about 70 times, in 10 years, GIX will become a gathering place of more global human resources in the future. At GIX, as part of efforts to foster innovation leaders, “GIX Innovation Competition” is also held. This competition looks for solutions with reality and prospect from students and innovators under 30 years old. More than 300 entries were received from around the world under the theme of “Connected Devices, Innovation and Change” for the first competition held in 2016. Three items of “Portable Diverse Physics Analyzer,” “Portable Air Cleaning System,” and “Simple and Low-Cost 3D Input Operation Glove for VR” were selected as the first prizes (referred to University of Washington (*3)). The second competition was held in 2017, with the same theme of “Connected Devices” as the previous year. The second competition, as a new attempt, had a special prize that recruited delivery robots as an efficient and feasible delivery solution in partnership with China’s O2O (online to offline) leading enterprise “Meituan-Dianping” (*4). This clearly illustrates that China is also putting high expectations on GIX that is attracting excellently innovative students from all over the world, with a view to securing promising talents. *4）”Meituan-Dianping” is a major company dealing with provision of apps for delivery in China. For the special prize (Special Meituan-Dianping Track), referred to https://www.geekwire.com/calendar-event/connected-devices-gix-2017-innovation-competition-project-registration/. * Referred to the report on the current situation of GIX in China (August 29, 2017) by our intern, Ms. Jia Chunhui. 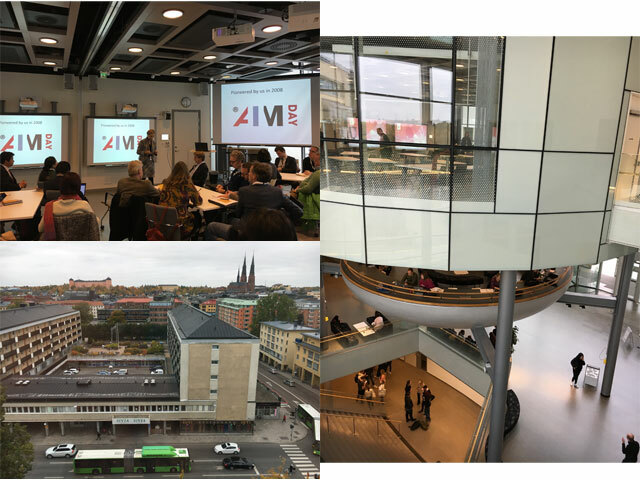 Located about 1 hour by car from the center of Stockholm city center, Uppsala University, the oldest in Scandinavia, is carrying out “AIMDay,” a project where researchers, experts, and people from corporates and organizations gather and discuss one problem for one hour. The procedure of “AIMDay” is; 1) issues are submitted from companies. 2) when researchers with an interest in that subject apply for participation, small discussion groups with a few from the enterprises and 5 or 6 from the researchers body, a total of 6 or 7, get formed, and 3) the schedule for “AIMDay” gets fixed. The fields of issues submitted from companies are not limited to innovation, but ranging from manufacturing industry to health-care industry such as cancer and diabetes. Discussion time is limited to 1 hour, but the follow-up process after discussion is also rich for creating new business. For example, if a good idea comes out during the discussion, you can apply for a funding system for commercialization, and you can receive support for application. “AIMDay” is currently being held not only in Sweden but also in other countries such as Oxford University and University of Edinburgh in the UK. The themes vary from “energy” (University of Edinburgh, June 2017), “aging” (Oxford University, July 2017), to “future manufacturing industry” (University of Edinburgh, January 2018), all of which are about cities’ growth. Sweden’s “AIMDay” initiative spreads to the UK, implementing practical methods for resolving issues in each city and for creating innovation. As described above, Fukuoka City and IRBC member cities are developing measures to create innovation taking advantage of the global networks. Now, let’s check the positions of the five cities of Helsinki, Barcelona, Seattle, Stockholm, and Fukuoka, whose case examples are introduced in this paper, in globalization and innovation. From “Cities on the ‘Third Axis’ plus 3,” we examine 8 indicators related to globalization and innovation and reorganize the five cities. 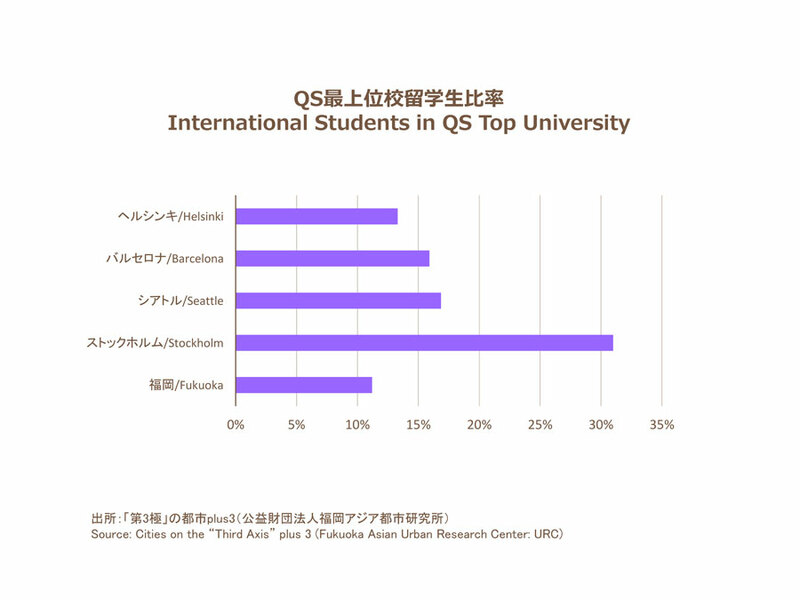 Specifically, the “number of patent applications per 10,000 people (metropolitan area),” “GDP per employee (metropolitan area),” “annual business startup rate,” “number of QS World ranked universities “rank of the top university on QS,” “number of direct flight destinations,” “number of foreign born residents,” “international students in top university” are used. Unfortunately, at present, Fukuoka’s position is not far higher than other cities, but the ratio of international students, the indicator to represent diversity of human resources, is 11% as of 2016, which is close to Helsinki and Barcelona. As the ratio of international students increased by 2% from the survey in 2013 (Cities on the “Third Axis”), we can see that attracting a variety of talents and creating global networks and innovation have steadily been carried out. 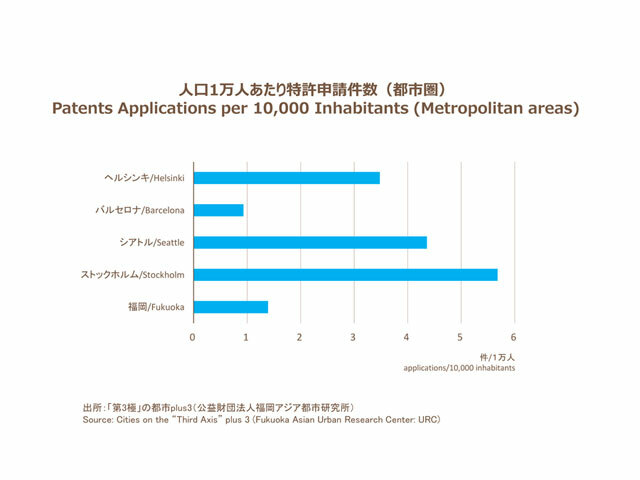 The number of patent applications per 10,000 residents, which is the standard for measuring innovation, is outstanding among the two Scandinavian cities (Stockholm 5.68, Helsinki 3.48) and Seattle (4.36), and the difference with Fukuoka (1.39) is about 2.5 times to 4 times. Fukuoka is the lowest when comparing the GDP per employee of the five cities, GDP of the region divided by the number of workers in the region. In order to see how entrepreneurial culture is rooted in society of each city, the annual percentage of startup of each country was compared. Finland, Spain and Sweden are all over 10%, followed by the United States with 7.4%. Compared with these countries, Japan’s figure is 4.6%, which indicates that the entrepreneurial culture is not yet rooted. In each metropolitan area, let’s compare the number of universities selected in the QS World University Ranking and the rank of the highest ranked university. The top school is the University of Washington, the only ranked school from Seattle, who established the GIX in cooperation with Tsinghua University (China). There are two schools from Scandinavia ranked within two hundred places. In Barcelona, the rank of the top school is low, but 4 schools are listed in the ranking. 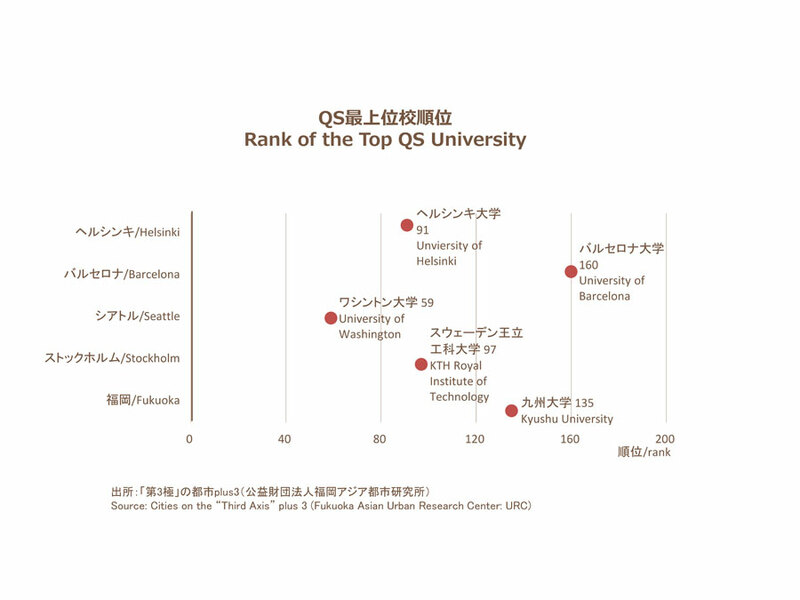 Fukuoka only has Kyushu University at the 135th place. 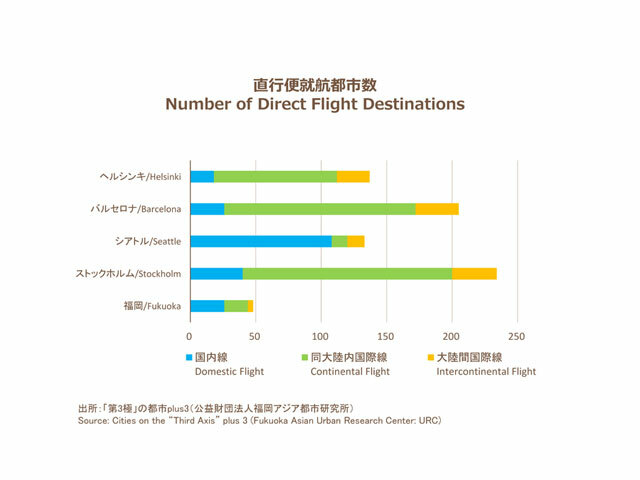 In comparing the number of direct flight destinations of international airports of the five cities, the small figures of Fukuoka are remarkable, but the number of domestic flight destinations is larger than Helsinki and Barcelona. In comparing the percentage of foreign born residents in the five cities, one in about 4 people in Stockholm, one in about 5 people in Seattle is born in foreign countries. 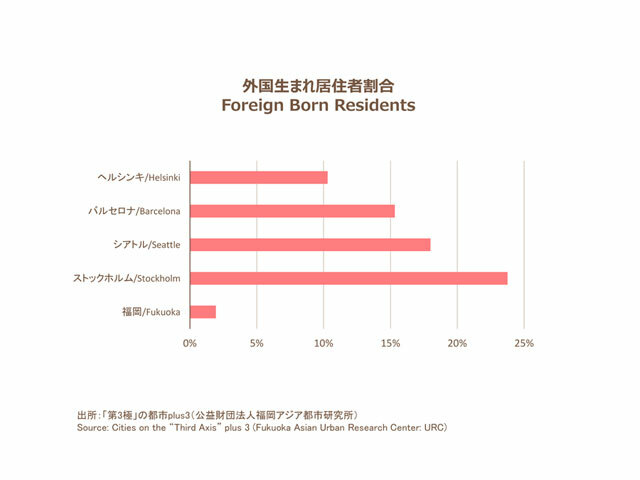 On the other hand, Fukuoka is the lowest with 1.9%, but the ratio of foreign students continues to increase as mentioned above, catching up with the other cities. Innovation, an indispensable element of sustainable growth of cities, is created through cross-cultural exchanges between ones from different fields, different industries, different sectors, and different cultures. 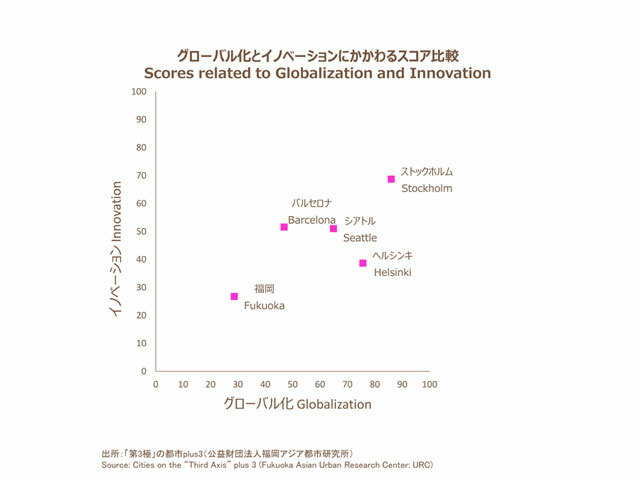 The graph below combines index data related to globalization and innovation in the previous sections, and places the calculated scores on the scatter plot. For each index of globalization and innovation, you can see that all other cities have higher scores than Fukuoka. As mentioned, however, Fukuoka City has actively built global networks, including global startup support collaboration projects and IRBC participation. Promoting globalization through further reinforcement of such global network and innovation through effective use of global networks will be an important key for improving Fukuoka City’s position. In addition to this, in the future it is also desirable that entrepreneurs and private enterprises that create innovation get help to utilize the global network better. In recent years, translation applications and interpretation support tools are also spreading with more ease. Thanks to these recent technological improvements, the language barriers that have been a major bottleneck in going overseas so far have almost been removed. 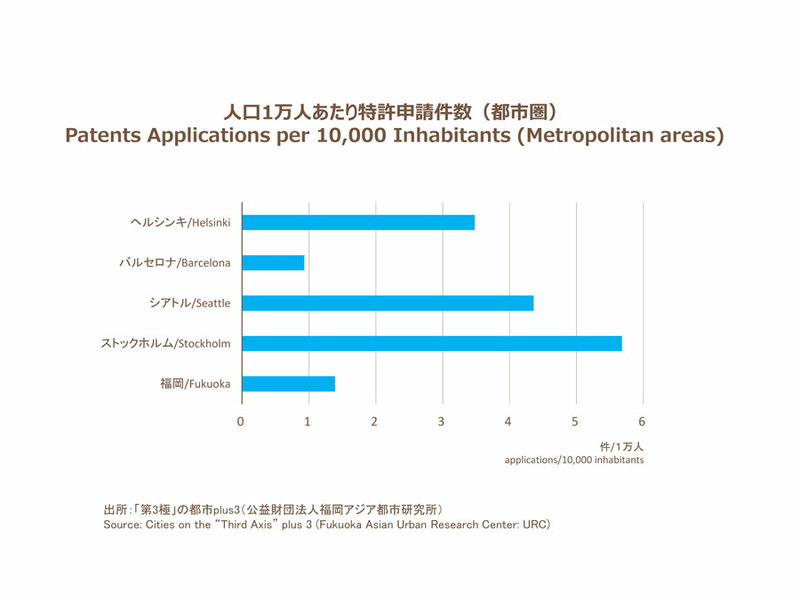 In Fukuoka City, the environment for new innovation is developed based on the existing global networks.